Stock Markets Panic Crash Continuing, Is the Stealth Bull Market Over? The BlogosFear is claiming victory though many of whom conveniently forget that if they had followed their own advice they would have already gone broke several thousand Dow points ago on the way up, meanwhile the mainstream press yo-yo's with every market gyration to explain what is beyond their capability to interpret, each bounce is followed by good news explanations such as agreement on the debt ceiling, each plunge is followed by a bad news explanations such as Italy and Spain teetering on the edge of default bailouts. The relatively mild summer correction has clearly morphed into a market panic event. However unlike many investors, I don't tend to panic, instead see opportunity in every crisis. Therefore my focus this weekend has been to update my buy list that will aim to capitalise on the ongoing panic as the Dow futures suggests. S&P puts another nail into the U.S. economies coffin with its credit rating downgrade, the eurozone continues to trend towards default of PIIGS and sharply higher interest rates on issuance of eurobonds (as euro-zone interest rates get averaged between bankrupting PIIGS and core Eurozone), with economic data increasing the odds of a double dip recession manifesting. So all of the bad news is true, but ultimately all that they will do is to ACCELERATE the INFLATION MEGA-TREND, which is the primary driver of prices be they consumer, commodity or assets. 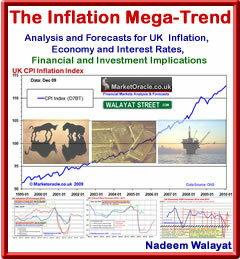 So if you really want to know how to preserve and grow your capital you need to know to keep on the right side of the Inflation mega-trend as covered at length over 18 months ago in the Inflation Mega-trend Ebook (FREE DOWNLOAD), following which little has actually changed in respect of the key drivers of the inflation mega-trend. Investing is HIGH risk even if one picks low risk large cap dividing paying and growing stocks, there still is a significant risk involved which is why investments have to be accumulated into target stocks with a view to long-term holdings that span many years if not decades, for that is how you actually beat real inflation, not from jumping in and out of holdings on the latest scare or market panic that takes all stocks lower regardless of each stocks differing fundamentals. Whilst short-term term speculators focus on the gyration of stock price charts, what they may be forgetting is the long-term impact of growing dividends that is the real key to profiting from stock market investments, therefore in my view dividends are more important than what the stock price does, as long as dividends are growing then the investment is safe because whilst companies can and do lie as to the actual state of their balance sheets, but the dividend does not lie, remember that! The strategy is simple in that the Inflation Mega-trend driven by the sovereign debt mega-trend as countries seek to default on their debts by means of high real inflation results in corporations raising prices which raises revenues which raises profits in nominal terms and thus raises dividends and hence constant dividend paying and raising stocks are a hedge against in inflation which should over the long-run be reflected in the stock prices as stocks are compared to one another in terms of price divided by earnings (P/E) and dividend divided by price (yield). So my long-run stock market investing strategy is simple which relies on the fact that democracies will always stealth default on their debts by means of high inflation as the primary driver of economies, for in democracies politicians seek to buy votes to get elected with money the country does not have, which is why you are not going to get price deflation as deflation runs counter to politicians objective to get elected by buying votes. Even in austerity Britain, the coalition government is STILL buying votes with money the country does not have to the tune of about £120 billion a year or about 9% of GDP. This is the real price of democracy in that wealth is systematically stolen from the haves and distributed to the have not's where only the super rich (top 0.5%) can escape the democratic wealth destroying cycle. You hear a lot of talk about the lost decade for stock market investors, what these commentators fail to consider is the performance of stocks with consistently rising dividends that one could easily during a panic event collect yields on as as high as 6% which then COMPOUNDS as the dividend is raised, resulting in a 10 year return of as much as 100% on the initial investment BEFORE stock price capital appreciation is even considered. As the PIIGS crisis illustrates that risks posed by many stocks can turn out to be lower than that of government bonds. Those holding PIIGS debt are sitting on capital loses of between 30% and 50% on so called low risk investments! So in my opinion panics ALWAYS breed opportunities to accumulate into high yield stocks and country and commodity ETFS as covered at length in the Inflation Mega-Trend Ebook. So whilst you read the rest of this article in terms of shorter term trend expectations, do remember that in terms of the long-run the current panic action is just noise, that is giving me and many other investors discounts on stocks of between 10% to 15% compared to where they we were trading just a few weeks ago. Growing sovereign Debt is a mega-trend that afflicts ALL democracies that manifests itself in INFLATION as countries are forced to default ont heir debt my beans of high inflation. Regardless of the what the debt deleveraging deflationistas have been continuously stating for many years now, stay focused on the inflation mega-trend as the primary driver for asset prices as a consequence of the megatrend's of sovereign debt default through high inflation, population growth impact on commodity price inflation, demographic changes in emerging markets on consumer and asset prices, and the inflation inducing climate change mega-trend. The academic economists may be blind for obvious vested interest reasons to the inflation mega-trend but it is real and powerful and will continue for the whole of this decade by which time rear view mirror looking economists that populate the mainstream press will say how did we miss the great inflation of 2010 to 2020? My investing focus as iterated at length in the Jan 2010 Inflation Mega-trend ebook remains the same to accumulate into this decade long mega-trend in which respect panics present opportunities. My focus is to invest in commodity, internationals and emerging markets for emerging markets growth will far out perform the west for the whole of this decade. Look it is not because emerging market people are smarter or cleverer than those in the west for they on an average basis are not, because of several; factors such as lack of freedom of thought in China, or lack of educational opportunities or poor infrastructure in places such as India. What is driving the emerging markets mega-trend as illustrated in the Inflation Megatrend ebook is the convergence of GDP's as the below graph illustrates (Jan 2010). Therefore the GDP of countries such as China and India can double but STILL lag far behind the west which illustrates how far they have yet to grow with all of the implications for commodity and asset prices given the billion plus populations of each of these countries. The Inflation Mega-trend ebook broke down where one could be investing to protect ones wealth which I can summarise as in stocks , commodities and the corporate bonds of low risk stocks. Now some 18 months on my analysis is also converging towards holding housing (UK), therefore if I were to break an ideal portfolio down today it would comprise 30% stocks and commodities, 10% cash, 40% housing, and 20% index linked / corporate bonds. My own portfolio currently stands at 28% stocks & commodities, 52% cash, and 20% index linked / corporate bonds so clearly the focus of my analysis is more on protecting cash from bankrupting banks and the UK housing over other markets. Volatility is high, markets are yo-yoing all over the place every few hours as illustrated by Fridays price action, asia is sharply lower and so are the futures, nevertheless here is my quick take. Technical State of the Bull Market - The Dow's last bull market high of 12,876 against the last close of 11,460 represents a 11% drop, so still well within that for a normal correction of between 5% and 15%. Credit Crisis Lehman's Event - The last bear market was intensified by the unexpected Lehman's bankruptcy, whilst the unexpected is well unexpected, the banking sector is far less likely to produce a Lehman's event now than in late 2008. Off course the focus is on the European PIIGS producing a Lehman event. However the Euro-zone has repeatedly shown that it WILL step in to prevent such an event by bailing out and buying government bonds, which means even the too big to save such as Italy, will at the final moment be saved though the process could be painful in terms of market volatility however the ultimate bailouts would result in a stocks rally. Price Patterns - The head and shoulders pattern is back - My take is that it is always visible just before it gets busted! The H&S pattern is less reliable than a coin toss ! Technical Analysis - A measuring move of the decline to A, from the break of support point suggests that a low is imminent around Dow 11k. However the severity of the current downswing suggests that an imminent low will be revisited / tested after a bounce. The lower high at B suggest the stock market is now in a down sloping channel, which further suggests an imminent low is likely to be tested and probably broken before the Dow targets a break of the down sloping resistance line. MACD - Very oversold and has hit the support channel line which suggests further downside is very limited and a bounce is imminent that targets the higher down sloping channel line. Elliott Wave Theory - May 2nd is clearly a major 5th wave peak which initially suggested an ABC correction which given the severity of recent price action suggests a further wave lower is likely. Volatility - VIX has spiked sharply higher virtually touching 40 from an early July low of 15. Similar VIX spikes usually coincide with major lows though need several days of price action to be confirmed, as 40 could spike further to 50. Clearly the stock markets remain immersed in panic mode so not in any state to make a new bull market high any time soon, I see the likes of Dr Doom Marc Faber, AFTER the event claiming that stocks are in a bear market as of 2nd of May 2011 and won't make a new high. WRONG. The only question mark is how long will the current volatility extend before the bull market in stocks RESUMES. That is not clear, the stock market is oversold and set to bounce, but after the bounce it could make another lower low. It is not clear, which is fine because the market is not always predictable. My best guess is for an imminent bounce to resolve in a retest of the lows, stocks historically tend to make major lows in September and October. The Bottom Line - The stocks bull market is not over, the current correction extends to about 11%. Therefore I have an on going opportunity to accumulate target stocks and will likely get another bite at the cherry after a bounce and plunge into Sept/Oct, after which the future prospects for stocks for the balance of the year will become much clearer. Your analyst disappointed that his target stocks are not dropping as much as the indices!